View Poll Results: Which driver is going to win the VASC Driver’s Championship In 2018? Thank you for all your years of support of Supercar Clipsal..
Shows the benefit of long-term backing I'd say. agreed. See your signature, its the only one which mentions a sponsor. How does a facebook post prove if its true, I cant find it in any media outlets. CLIPSAL has dropped its naming rights sponsorship of the Adelaide 500 Supercars event, confirming the 2017 race will be the last to bear its name. Clipsal by Schneider Electric has been the major sponsor of the event since 2000 but its contract expires at the end of the 2017 event. The Advertiser understands negotiations are progress with service station chain On The Run to take over naming rights, with rumours circulating in circles involved with the Clipsal 500. The former chief executive of the Clipsal 500, Mark Warren, who resigned in May, now works for the Peregrine Corporation, the parent company of On The Run, a South Australian company owed by the Shahin family. A spokeswoman for On The Run — known now under its OTR branding — said the company had not been approached for any such deal. James Courtney, the winner of race two of the Clipsal 500 in March this year. “Should the opportunity come up we would be happy to sit down and discuss it,” she said. Sport Minister Leon Bignell would not confirm rumours of a potential OTR takeover of sponsorship. “The State Government looks forward to working with a new partner in the lead up to 2018 and beyond,” Mr Bignell said. “South Australians love supercars — with this year’s event generating more than $60 million for the state’s economy. The sponsorship announcement comes in the wake of the abolition of the South Australian Motor Sport Board, which oversaw the event, in favour of the South Australian Tourism Commission, in 2015. Clipsal said it was proud of its long-term relationship with The Motor Sport Group, and of a joint commitment to make the race a landmark event on the Australian motorsport calendar. 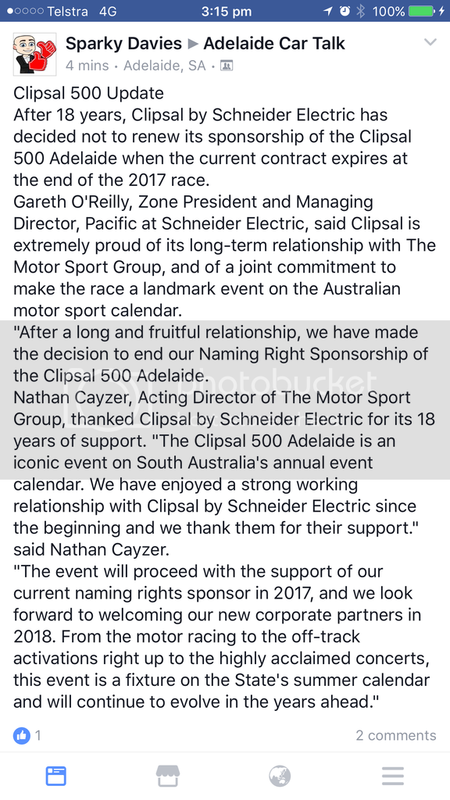 “After a long and fruitful relationship, we have made the difficult decision not to renew our naming rights sponsorship of the Clipsal 500 Adelaide," Gareth O’Reilly, ‎zone president and managing director, Pacific at Schneider Electric, said. “This is as a result of a change to our global marketing approach — we’re currently working on new ways to connect and engage with more of our customers, which we’ll share in due course. Nathan Cayzer, acting director of The Motor Sport Group, thanked Clipsal for its 18 years of support. “We have enjoyed a strong working relationship with Clipsal by Schneider Electric since the beginning and we thank them for their support,” Mr Cayzer said. Definitely one of the great motorsport sponsorships. Eighteen years is a long time for any relationship. Last edited by Jack65; 28 Nov 2016 at 07:56. According to Phelps today, the circus is looking at a regional Victorian street race in much the same vain as Newcastle has filled the Homebush void, in particular to replace either Sandown or Winton. Dislike. VASC people, please don't replace a circuit event with another street track. However, if looking to the future, when Sandown will probably need to be replaced full stop, then I guess a street track might have to do. I can't remember where I read it, but I believe the last 10 year deal was signed by the Clipsal owners just before they sold the business to Schneider Electrical. I'd have to play devils advocate here, and say that regional Victoria is nowhere near as economically strong as some of NSW or even QLD. Other than Geelong (which is going to be in recession due to Ford's closure), Ballarat or Bendigo spring to mind as the only likely candidates, I use the word as a term of probability only. I am not sure if either of these could support such an event, but Ballarat does have a lot of business based there, and some interesting places you could do a street track.